GENIUS 2000 is the third studio album by Japanese singer Namie Amuro, released on January 26, 2000. The album reached #1 on the weekly Oricon charts and charted for eight weeks. It sold 802,740 copies, becoming the #28 album of 2000. Wow, dem capital letters. Anyway, let’s start with Make the Connection Complete, the only normal listing. It’s quite a useless intro, it does give a good intro to what the album is supposed to sound like (futuristic because oh wow, the 21st century), but all the computer sounds just bore me. LOVE 2000 is more promising, it also introduced Namie’s newly improved vocals! They really went all the way with the arrangement, including everything they could possibly find (kick drums, synths, strings, a harp, subtle autotuning…) to create this energetic song. The middle section was stretched a bit too long, but the rest of the song has a pretty awesome vibe to it. Despite the aim for a more ‘new century’ sound, RESPECT the POWER OF LOVE sounds like every 90s summer song, but that’s not meant in a negative way. It’s like an improved ‘DON’T WANNA CRY’ with its light chorus and gospel choir in the background. The verses are a bit darker and Namie is straining a bit in the choruses singing in her head voice, but there’s a nice flow to the song and Namie doesn’t drain her own vocals like she used to (definitely improvement here). Ah, a new track. LEAVIN’ FOR LAS VEGAS has a nice beat to it and I like the groovy guitar riffs in the background. Namie is singing in her lower register and it’s as low as I’ve ever heard her sing. Sometimes it sounds good, other times she’s not hitting it well. As for the song as a whole, it’s actually kind of boring since it’s so repetitive, too bad because the arrangement has potential. SOMETHING ‘BOUT THE KISS was made in collaboration with Dallas Austin, so this has a more western R&B sound to it, very ‘turn-of-the-century’ and fun. It’s pretty catchy, maybe a little too repetitive after a while but it has something. It’s definitely better than the previous track, I even liked Namie’s rap. The only issue is the English background vocals while Namie herself is singing in Japanese, that was kind of distracting. I’m still having a hard time identifying the style of I HAVE NEVER SEEN, I don’t know if it’s a ballad or midtempo but there is this constant anticipation of a faster beat. Not very relaxed to listen to. Namie’s vocals have definitely improved for this first A-side of the era, compared to the previous one, but it’s still not quite there yet. Eventually, there’s nothing for me here. STILL IN LOVE felt a little off because it’s a new track written with the new concept in mind (probably), so it sounds so different. I must say I like Namie’s vocals so much more and she sounds like she does nowadays, much more comfortable. Other than that, it’s not very special and it’s another example of English and Japanese not mixing very well. I like the Spanish guitar opening the fast paced MI CORAZÓN (TE’AMOUR). The song doesn’t really sound bad overall, it has a nice tempo to it, but the pitch seems a little too high for Namie to sing comfortably without straining and, I hate to say it, it’s not catchy or anything. I do have the feeling this could grow on me in the future because of its Spanish influences. Years ago I used to listen only to YOU ARE THE ONE feat. IMAJIN, the better version that is (the single version was horrifying). It’s so much better than the single version, the arrangement has improved so much as well. It’s still true that the real stars are the IMAJIN boys with their soulful vocals, Namie still needed some lessons. Yet, compared to other tracks, this was one of the better tracks on the album. Now we only have 5 new tracks left, of which KISS-AND-RIDE is next. It’s a slow song with a mellow sound to it that I like very well. Namie’s vocals are autotuned, but I don’t even mind because it keeps her voice on track. I got through the whole thing, but only because my phone kept me occupied. This song didn’t because it gets boring too soon, it shouldn’t have because it could’ve been so much more. Staying in the ballad vibe, THINGS I COLLECTED features an acoustic guitar, strings and soft percussion while Namie sings in her lower register again. I can’t help but think she sounds kind of shaky, just not solid at all, and the song doesn’t grab my attention at all. Maybe because it’s way too slow and dragging? Can I stop listening to this album yet? NEXT TO YOU doesn’t do anything for me either. It’s also an Austin Dallas production with slightly better English-Japanese mixing, it’s uptempo and it could’ve been catchy, but this just doesn’t appeal to me because of lack of originality. Maybe ASKING WHY isn’t too bad? At least there’s some variation in the song and there’s something enjoyable about it. 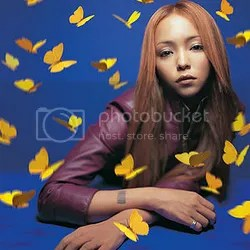 Also, Namie’s vocals are better than in other tracks, she’s holder her own more. I still wouldn’t say this is a very good song, it’s just better than some other cr*p on this album. Bad Engrish opens GIVE IT A TRY. I’m thinking about not giving it a try at all, but oh well, last song. This is just plain ugly, I’m sorry. LOG OFF isn’t interesting either since it only closes the album with a piano tune. I’m not going to waste much time on this. GENIUS 2000 isn’t my thing at ALL. I’m glad Namie is a better artist and singer now, having more control over her vocals and having more variaty in her music. This album got way more praise than it should have, if you ask me. Nope, not liking this at all.